The builders of Stonehenge 5,000 years ago were almost completely wiped out by mysterious ‘Beaker people. Stonehenge has a proud place in Britain’s history as one of the wonders of the world and the best-known prehistoric monument in Europe. Instead the British are related to the ‘Beaker people’ who travelled from modern-day Holland and all but wiped out Stonehenge’s creators. The findings are ‘absolutely sort of mind-blowing,’ said archaeologist Barry Cunliffe, a professor emeritus at the University of Oxford. ‘They are going to upset people, but that is part of the excitement of it. 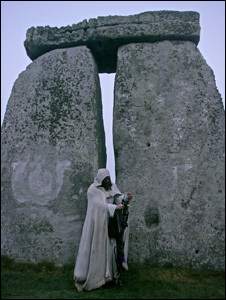 Stonehenge is perhaps the world’s most enigmatic pile of rocks. Some archaeologists think it was an observatory, others a place of healing. According to Swiss author Erich von Däniken, the building techniques were passed on from aliens; medieval texts show it being constructed by Merlin. However, according to Win Scutt, properties curator at English Heritage, “the landscape in which Stonehenge sits is far more interesting than the circle itself”. Despite this, he adds, few people explore the wider area. That landscape has been poorly treated in past decades, with traffic on the A303 and A344 roaring right past the site. In 2013, the A344 and old car park were removed; now, the landscape has recovered, grass has regrown and Stonehenge has been reconnected with its ancient processional avenue. The next step is to re-route the A303, which cuts through the World Heritage Site, compromising its integrity. The Government has committed to building a tunnel for the road; in May 2016, the International Council on Monuments and Sites and Unesco backed the scheme, although current proposals remain controversial. It’s your final chance to have a say on the plans to build a tunnel for the A303 at Stonehenge. It’s your final chance to have a say on the plans to build a tunnel for the A303 at Stonehenge over the next weeks before they get sent off to go for planning permission. A public consultation starts today (Thursday Feburary 8th) and lasts through until Friday April 6th, with some public exhibitions planned for us to take a look for ourselves. An exhibition at the site gives fresh insight into the builders of Stonehenge, showcasing research that suggests animals were brought from as far afield as northern Scotland to feed the engineers and for lavish midwinter feasts. The Larkhill dig, which is taking place because the land is being cleared for military housing, has also unearthed some fascinating 20th-century history.